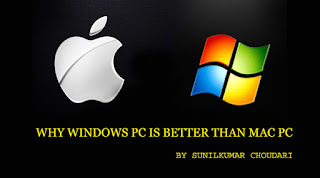 WHY WINDOWS PC IS BETTER THAN MAC PC.? > Gaming on PCs is better: Gaming has a long history with Pc, many people buy expensive Pc for gaming.PC as the same price as Mac book can easily run all new games available in the store.Pc also have the majority of games that aren’t even available on Mac.Mac has become famous over the year, they were too expensive when they were first introduced, so game developers never really showed interest in making games for Mac. This really isn’t surprising for anyone, people who have used both know that.MacBook Pro costs around Rs.97545.15, with that price you can get Pc with the way many features, which will be much smoother also for gaming and well you will sell it, you’ll get retailer price around Rs. 26012 to Rs. 32515 on both MAc and Pc so why not go for better? MacBook fanboys will say “it costs more because it holds more value” but some with no brain will choose Expensive Mac when they can get Beast Pc on that price. By that, I mean in hardware flexibility Mac is nowhere near Pc.You can update hardware as you like SSD can be added easily, you can add more RAMs and you can change your graphic card when ever you like and if some thing breaks or stops working, you can just change it or repair it at low cost.With Mac, you can’t do any of this and if something stops working or you want to customize something, it can only be done by > Mac Development is lacking: For past 2-3 years, Apple really hasn’t shown any interest in MacBooks, they aren’t really improving them just minor upgrades have happened.All apple really focuses on is “IOS” and nothing more than that. On the other hand, Microsoft is really developing windows day by day.Most of the Softwares available in Market support windows, Mac also have much software available but they are nothing when compared to Windows. Freeware is also available for windows users, Pc have Programs around 50,000 Compatible with it and MAc only has around 5,000 which is a huge margin. >Microsoft Office is everything Mac doesn’t have: Aside from Gaming, mostly people buy Windows PC for Office. It’s perfect for Spreadsheet, also Office has Calendar, presentation programs, and word processor. An office is the one of reliable software to this day.The majority know about Excel and that’s why people prefer it over many programs available in the market.Microsoft does have “Office” available for Mac but it lacks many features which users find annoying and prefer Pc over Mac. Also, People find Macs easy to use but still everyone has a different mindset and people will buy what they like. But as far as I know, Windows Pc is a better choice.